Buckhead Betty ... on a Budget: Hello Fall! I have missed you! Hello Fall! I have missed you! Fall is my FAVORITE season. Ok, so I like getting freckles (note: no tan on this pale Irish gal) in the summer, and I like the pretty flowering trees of spring. And actually winter is a close winner, since I love scarves and peacoats and snow showers. But I LOVE Fall. Sadly, Georgia doesn't get too much of a 4-season schedule. We blow through Fall and Winter right into the fastest Spring you have ever seen, straight to the longest summer ever, maybe second only to Florida's. Or Arizona's. Blah. So you might imagine, I take advantage of this crisp air as much as possible in these short two months. So that means it's time to eat more outdoors! 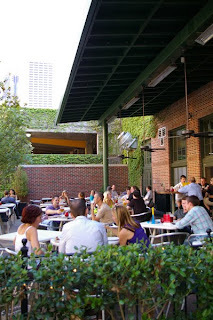 There are a ton of restaurants and bars around Atlanta that have great patios. What are your favorites? Here are some of mine, try them out if you haven't already! I also just heard about Leon's Full Service in Decatur from a family friend after my last Brick Store post, since its the same owners. Supposed to be great outside! This is on my list of places to check out soon.